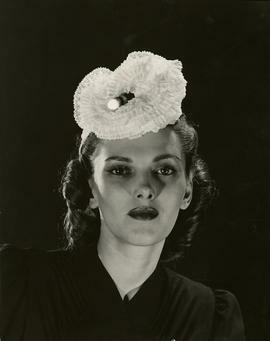 During the 1930's, 40's and the early 50's, when hats were considered required accessories for well-dressed women, Sally (Josephs) Victor (1905 - 1977) was among the foremost American milliners. She first started making hats at Macy's in 1924, then for L. Bamberger & Co. In 1927 Sally married Sergiu F. Victor, a hat manufacturer. In the late 1920's and early 1930's she worked designing hats for him. Opening in 1934 on 53rd Street in New York, Sally Victor's own millinery business grew to become on of the largest hat companies in the USA. She was one of the members of the Edward C. Blum Design Laboratory, and often used the Brooklyn Museum's collections to draw inspiration for her designs. She was so connected with the Design Lab that she participated in several collaborative exhibitions at the museum. Her work is characterized by a special quirkiness that could often be traced back to interesting sources such as Native American tribes, the artist Henri Matisse or Japanese armor. She also combined traditional hat-making materials such as felt and silk with new synthetic materials in unique ways. In the early 1950's Victor's Airwaves hat, which resembled a cut-out pie crust, was popularized when Mamie Eisenhower wore one to the Presidential inauguration. A new, lower-cost line which was geared toward a younger customer, Sally V, was launched in the 1950's. The business closed in 1965. According to her May 16, 1977 obituary in the ''New York Times,'' Victor described her mission simply as "designing pretty hats that make women look prettier." Materials came from the Museum at FIT in November 2017. They were previously donated to the museum in 1982 by Mr. Richard M. Victor. Arrangement, description, and archival processing by Diana Cadavid , FIT, NY, NY, USA.